Businesses: Are Your Twitter Accounts Set To Private? I have always loved how airlines are using Twitter. Browsing through some airlines’ Twitter pages, I found @QatarAirways account to be a little… disturbing, in a Twitter sense of course. What I noticed about them was that they set their Twitter account to PRIVATE. Airlines and Private accounts! That doesn’t sound like a good combination, seeing that there are constant possibilities of delays, flight booking problems, flight cancellations… you know the drill. I have faced some problems and airlines like Malaysia Airlines and Airasia have never failed to help me through Twitter and Facebook. Thumbs up to both of them. 1)	People can’t see your tweets. It won’t appear on your timeline and it won’t appear on the Twitter search engine. Literally, you don’t exist at all unless someone requested to follow you. 2)	People can send you a tweet, BUT….. If they have not requested to follow and you have not approved it, they wouldn’t be able to receive your tweets, see your tweets, or reply. This means that when a customer, who doesn’t know much about Twitter or is new to twitter and didn’t sent a request to follow, sent an inquiry or a problem that they are facing and you proceeded to respond to their inquiry, they would not get it. They would then think that you didn’t reply when you actually did! Some airlines learned the hard way when they responded late. Some had great success of responding to tweets just like how KLM is using Twitter. What about this? The reason why I say so is because it takes time to request to follow, wait to get approved and then I am able to received tweets. Twitter was built to be in real time, so don’t make it troublesome for someone who wants to get in touch with you. I couldn’t think of any reason why @QatarAirways set their Twitter account to private, unless it’s an exclusivity thing that I didn’t know of. It could even be a “method” to attract more people to follow them, since you can’t see their tweets and the only way to see their tweets is to follow them. My advice is to not control how things are supposed to work, just let it flow. I find it shocking that businesses would set their accounts to private, what is the point in even having a Twitter account? Yup! that was my initial reaction too. I emailed Qatar Airways. No responds yet. Spot on post Aaron. If someone ever comes and tells me that bloggers aren’t journalists you know what I will say. 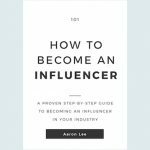 You haven’t heard of Aaron Lee have you? It is really great how you are uncovering some amazing stories here and also helping other users, companies etc. to get it right instead of bashing them for doing wrong. This is journalism in the Social Media age. Love it. Keep it up and this time tweets already are in the Buffer, even before I commented ;). Could it be exclusively for their clients only? Due to security reasons? WOW! thank you so much for the compliment Leo. Its one of the biggest compliment I’ve received up-to-date. I actually thought this article was a little “bashing” for some reason. I don’t usually call out companies for doing something wrong. Usually good. Journalism is the last thing in my mind that I wanna go into since English was never my biggest strength. This article was edited by a friend of mine. Just like the other articles. For non edited english, its in comments and tweets. LoL! Cheers and thank you for the comment! I’ll definitely remember this. It’s unimaginable to me why any business that takes the time to be on Twitter would set their account to private. You are right Aaron – @unmarketing would throw a fit! Oh no worries at all Aaron, it is well deserved with the great work you are producing. Oh ok, yes, I feel your call to action is just quite strong which is good, yet it’s definitely not bashing, but very helpful for them. I am sure they will figure it out with your post, also I cc’ed them in my tweets ;). Speak soon and the pleasure is all mine buddy :). I get annoyed when individuals protect their tweets, so a business doing it is absolutely baffling. Twitter is public and intended to be for sharing. If you don’t want people to read your tweets, don’t tweet at all! No idea Frank. Don’t think I know any business whos twitter account is set to private. 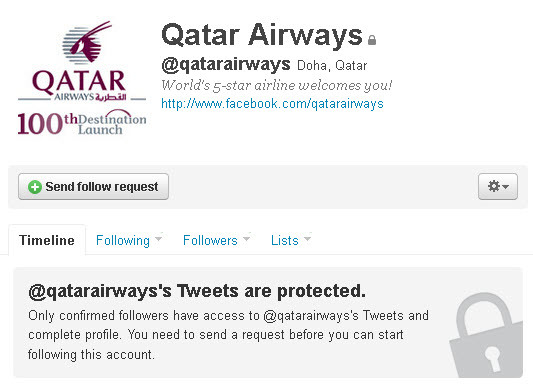 As for Qatar Airways, they are not using twitter to its fullest potential by doing so. Could be they are new to twitter and they want to take extra precautions since in the middle east, facebook is more popular than twitter. Strong words Sara but definitely true. I guess they aren’t ready for the world yet. Hopefully they would leave a NICE and not bashful comment here like how Four Seasons Hotel does on every blogs mentioning them. They commented on my blog before when I wrote about them. I’m in complete shock that an airline would protect their tweets! Unless they are trying to stay “exclusive” as you mentioned above but really? II can think of a couple reasons. They could be experimenting with the medium before going public. They could be trying out a new employee in the post and want to make sure they can handle it. Or they could just be squatting the account for now. There are other possibilities like that where it makes sense. I totally agree with the private tweets aren’t real time. Twitter is a place where we can share our thoughts and in my opinion with the less privacy issue. It kinda irritates me somehow when I see those private tweet account. I think Cromely could be spot on here — sometimes a business is trying to get the hank of a medium first. I’ve sat down with some business owners who needed some help understanding the different ways they work. As they do have a fairly good Facebook presence, maybe they just need to read more AskAaronLee posts to be ready to go live on twitter! Another thing that is bad for companies to do: If I follow you, don’t make me go to truetwit.com to validate I’m not a spammer. Use social media tools to block real spammers. Don’t annoy your real customers right off the bat. like I said in my RT…DUMB! I’m in agreement that NO business should have a private twitter account. I am also in agreement with one of the comments that NO business should use TrueTwit validation. Businesses need to make it super easy for customers/prospects to communicate with their brand, and any friction or delays immediately hurts your brand. Yes, those are possible, however they are already doing an amazing job on facebook with more than 200k fans (if i am not mistaken). Although they are experimenting, I still feel they could be more open. How bad can it be right? LoL! Spot on Andrew! I’ll get them to read my blog lol! I am still waiting for a respond from them that could possibly give us more idea on this. Exactly, I don’t think privacy is a good thing for an airline lol! Their facebook page is very public indeed. I’ve check the facebook page and even posted an inquiry about this as well. No respond yet. It could possibly be that its an oversight from Qatar Airlines. It might be that its all been outsourced. Why would a public service company hide themselves from the public (i.e. Twitter domain)? So many people could make assumptions about the company which could spill over to other media platforms the company is using. For a corporate entity, protected tweets could mean ‘we have something to hide’ or ‘don’t bother getting in touch with us on Twitter’ or ‘we are just here for the sake of it’. For individuals, I do understand why anyone would want to protect their tweets, but for a corporate entity…doesn’t make any sense at all. And to you Aaron, I honestly think you’re one of the best things to have happened to social media. You are virtually my number one source of all things social media related. Keep up the good work and I wish you continued strength in educating the rest of us about all things social media. I came up with a few assumptions and I was actually hoping Qatar Airlines would comment here or through email because I emailed them too. No respond yet. Most probably their presence are outsourced to other companies and they decided not to respond. That is what I thought. I guess they have a “dead body” to hide in the company for not showing their tweets. Too bad though, they would definitely be using twitter to its fullest potential by opening up. Thank you so much for the praises, definitely made my day because of that comment. Will definitely treasure what you said. The only reason that a Twitter account should be private is if it is being used for personal reasons. A business or company page should never be private. All a private profile does is minimize the opportunity to connect with a target audience. Another airline – Qantas – has learnt the value of social media for crisis management and branding. In fact, it’s responding pretty quickly by putting together a team dedicated to monitor the social spaces. Great news in my opinion, we can hopefully expect better service recovery from Qantas in future. and stalkers ! It’s a shame that Twitter has no more options in the private section, you have 2 things on twitter, open and private, open is really open and private is really shut yourself down from the outside world. The block function has no function on twitter at all, people can still read your tweets the only thing that the block function will do is that you can see the tweets from the blocking persons. They can still tweet to you and the rest of the world can still see what they tweet to you. A better option was that the people who you are blocking can’t see your tweets at all, also not with a search. i am in court with a young man who has a private twitter.He does have a couple of hundred following him. Of course he would never let me follow but could it be that the firm that he works for uses twitter just between their employees. 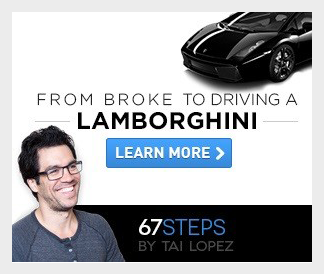 he works at a financial firm “fixFlyer”. He is on linked in and facebook so he is not so private.